Do you love to meet new people while at the same time serving God? Well, this ministry might be a good place for you to serve. The Ushers and Greeters Ministry is composed of warm and dedicated individuals whose goal is to bridge the gap between the visitors of the church and the members of the Congregation. As an usher or greeter you will greet people, assist them in finding a seat, answer any questions they might have, take up the offering, and distribute information on behalf of the pastor or church. These are some of the tasks that you will be involved with as an usher/greeter, but the ministry goes beyond that. The key is to get connected, stay involved and serve with all your heart. The media ministry’s mission is to glorify God, by ensuring that His Word, our praise, and song to Him is seen & heard clearly. 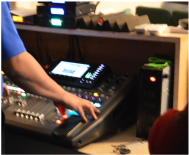 LMC - Media Team makes sure that the audio and visuals are without distraction or interference within our local church, and throughout the world as it’s broadcasted live or distributed on media with the highest video, audio, and production quality available. There are many opportunities for you to serve in the Media ministry. LMC staff is here to help you learn what you’ll need to know and have fun in the process! We are looking for those who desire to continue to learn, who are team players, and most of all are committed to serving God. The music ministry consists of a praise team and a hosts of musicians. to serve God with excellence in song and to elevate the worship to a total praise environment that encourages, ministers, and helps lead the unsaved to Christ.